If you’re at all a beauty junkie like me, every new product that comes out that touts to fix, plump, enhance, erase or whatever sounds like gold in a jar. I always have to try the latest lotions and potions so when people ask about my favorites I’m never sure because I’m likely already on to something new! The problem with this obsession or…hobby…is that it can get a tad expensive. O.K. a lot expensive. So when I found out about NewBeauty’s TestTube program I thought, O.K. now this is an absolutely cool and reasonable way to try out all the latest and greatest products, without breaking the bank. With the NewBeauty TestTube Sampling Program, you get four tubes a year stocked full of deluxe samples of the best beauty products in the market. Now these aren’t those teenie samples you can sign up for online or tear out of magazines that yield just one use or application; the size and value of the beauty goodies you’ll receive each month is a deluxe version and the price of the goods will always exceed subscription price of the TestTube. Until you cancel, you’ll receive a new TestTube full of beauty products every three months to sample. The TestTube costs just $30 (plus $9 shipping and handling) and you’ll have the opportunity to log on to NewBeauty’s Web site and submit a review of any of the products that you try. You can cancel your subscription at any time. It’s quite the smart and savvy way to try out the newest and best products on the market while being economical too. After all, who wants to spring $150 on the latest IT cream if you aren’t even sure that you’re going to like it? I sure wouldn’t. And it’s also a lovely way to get introduced to new brands you may have no heard of or tried before. 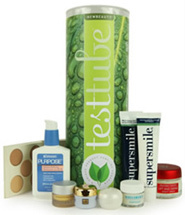 Just to give you an idea of the fabulous names involved, some previous brands that have appeared in the TestTube include the Obagi System, Estee Lauder, dr. brandt, Jane Iredale, Bioelements Professional Skincare, supersmile, SkinMedica, N.V. Perricone M.D. Cosmeceuticals and more. It’s definitely a unique way to sample those beauty products you were so curious about anyway. Also, a bit off-topic from the TestTube but I just had to share…when you first log on to the NewBeauty.com Web site, they have this supercool feature that lets you upload a photo of yourself and their system projects how you’d look with certain procedures (i.e., botox or lip injectables). Just thought it was a superfun tool if you’re considering some type of cosmetic enhancement. You can get the NewBeauty TestTube here. How to Properly Cleanse Your Skin! 5 Bad Moments in Beauty for 2010. This is so cool! I’m a beauty freak as well…spend hours in Sephora drooling over eveything I can’t afford. It’s totally an obssesion so this is perfect! sounds liek christmas 4 times a year! I think this is a great idea for some women. Me, on the other hand, I don’t experiment too much with skincare products. I tend to keep with what works. “test tube program” just sounds so scary to me! I like this idea! I’ve always wondered though when you get a sample, if they give you enough of it to see results. Especially if it’s a wrinkle cream or something along those lines. This is beyond awesome!! I can’t wait to receive my first test tube.